Let’s create some fresh language. It’s important to focus throughout this process, not fall into a rabbit hole of research and distractions. You will make mistakes. You will write things wrong. So maybe do this exercise on paper to avoid imprinting your raw words into a computer’s memory. You will get more out of this exercise if you explore your own memory, without digital performance enhancements. Revise and type up your flow later, if you like it. Prepare to go analog. Get out your notepad and pen. Get a stopwatch that will beep after ten minutes, preferably not from your phone. Print this out, or better yet buy “Carrying the Darkness” and mark the following ten poems with the prompts. Put your phone away. Walk down to a local park or coffee shop and do this work on a table there, away from the kids, away from Reddit, away from the huddled masses yearning for your attention. Shut off distractions and focus on the art of textual communication. 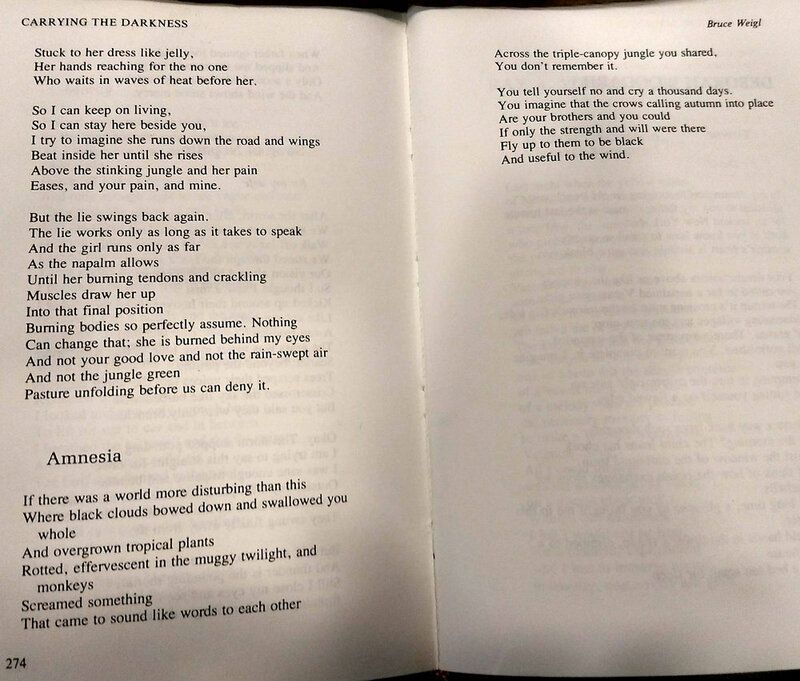 The following ten poems are taken from "Carrying the Darkness" Edited by W. D. Ehrhart. Read each poem, and then take about two minutes to reflect. If sitting there in silent contemplation bothers your body, if you’re feeling anxious about what to do with your hands while thinking, maybe dance in a large circle, sprint a hundred yards, do sixty push ups, make a cup of tea. Get your mind in the zone for each poem. Then write for ten minutes straight. You could do this with a stopwatch, or just write until you are out of words, until your last thought escapes. For each of these prompts write your words, right out of your brainwaves. Write onto the paper. Don’t stop. Don’t lift the pen from your page. Just go. 1. Color Associations - Pick a color to repeat and explore your memory. Whenever you lose the image that you are conjuring, return to the color, and expand on its many shades. Think of this color as a metaphor for deeper truths as well, or as a stand-in for another idea. Explore the potential of this color, how and where it might appear. 2. Senses Other Then Sight - Write a scene using other senses than sight (flavor, scent, sound, feel). Try eliciting a moment, building a story from the ears inward. Listen. Taste. Touch. Smell. Bring a scene and story to life out of your mind instead of through your eyes. 3. Build Anticipation and Let it Ride - Develop a scene and slowly add action. In the end, do not the the tension go. Revel in the potential of whatever might or could happen. 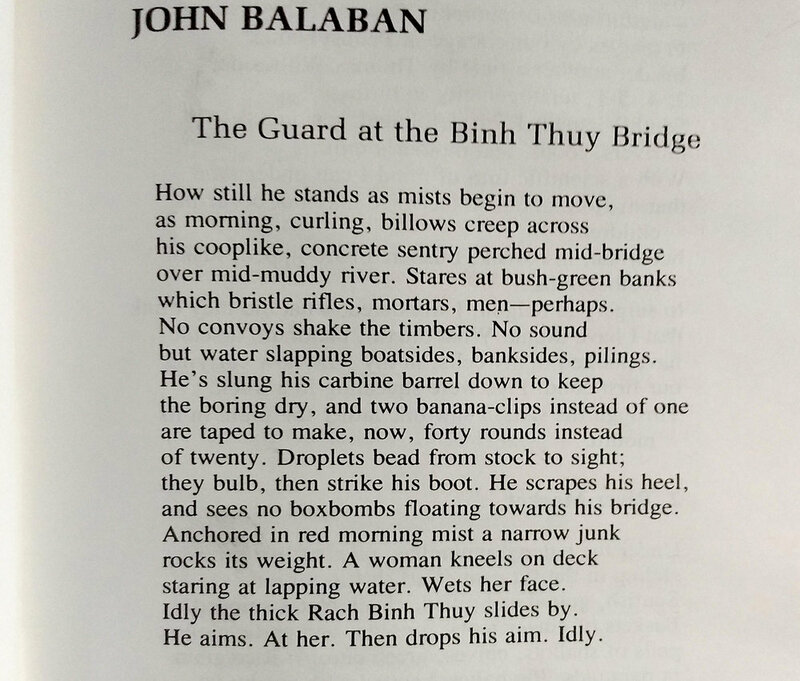 Use active language in describing the scene, like Balaban does: “billows creep across / his cooplike…” and hint at whatever dangers “boxbombs” might be floating. 4. Layer Society with Appearance and Explosions - Describe a place and time you’ve been as though it were a historical moment. Think in generalities. What are others doing at the same time, a block away or on the other side of the globe? 5. Time in Action - Decisive events that occur in seconds, can expand out in both directions. There’s the aftermath. There’s the series of choices that initiated the action. Write about an accident. Focus on the moment it happened. Linger and describe what happened before and after. 6. Cause and Effect - Explore the responsibility and ramifications of your work. Think about something you do or have done on a regular basis, and its effect on others. Every action creates a reaction. Can you enter the head of someone affected (positively or negatively) by something you did? 7. Excavate the Tedium - Think of your most simple duties on deployment. What did you do in the Mess Hall, or before going to bed. Did you have a routine in the morning that you kept? Describe some simple action, and build from there. 8. Inverse Elegy - Write an elegy for an enemy or from an enemy’s perspective. The goal is not to dishonor the dead, but to complicate death and conflict. Put a death in your mind, and write about it from a foreign perspective. 9. The Second Person - Address your reader. Write about an experience in the second person. Build a scene around your reader, and place them there. Make them the object of your own experience. Imagine seeing your younger self in a mirror and describe where you are, addressing yourself objectively. 10. A Benediction - Remember something, like a moment or an image or something you did, and detach yourself from that memory. Write about that past time abstractly, and project your role in that moment against a backdrop of things the people around you were doing as well. Did you do anything different? Did you do something more, something less? 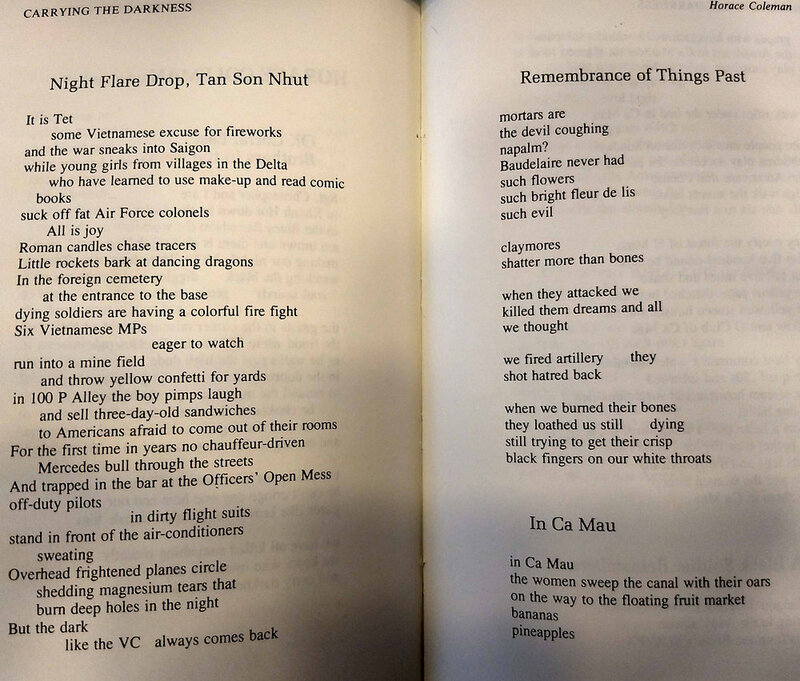 [Fair Use Clause] a) This is educational content, b) used to inspire new writing and comment, c) photographed in public from the original print, not digitally copied or transcribed. The Editor of this poetry collection, W. D. Ehrhart approved this post. If you enjoyed these poems, and would like to read more like them, order Carrying the Darkness from the publisher, Texas Tech University Press.